This contest ends on 31 March 2019, 11.59pm, and 10 winners will be announced on 5 April 2019. This contest is open to all Singaporeans and Permanent Residents of Singapore, currently residing in Singapore, over 18 years of age, except employees of Northpoint City and Frasers Property Retail Management Pte Ltd, its advertising agencies, tenants of the malls of Frasers Property Retail Management Pte Ltd, their immediate families or anyone else connected with this promotion. No third-party entries, bulk entries or entries submitted by agents will be accepted. 1. 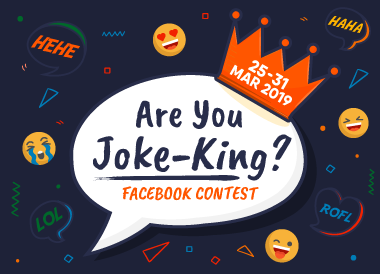 This contest is ‘Are You Joke-King?’ and ‘the contest period’ is from 25 to 31 March 2019 (11:59pm), inclusive. Ten (10) winners from Facebook will each receive a pair of tickets to The Butterfly Park and Insect Kingdom (worth $20) and $50 worth of Retailers’ Vouchers. One (1) eligible entry by a participant consists of their funniest joke, and submitted as a comment on Northpoint City's Facebook contest post. 5. At the end of the contest period, all eligible entries will be compiled. The Management of Northpoint City will select ten (10) winners based on the funniest joke crafted by participants. Winners will be announced on 5 April 2019 via a winners' announcement post on Facebook. 8. All participants selected as winners in this contest must contact Northpoint City via Facebook page Private Message by 14 April 2019. Selected winners must provide the first and last two characters of their NRIC eg. S9XXXXX8Z, Full Name as per NRIC, E-mail address, Contact Number and Date of Birth for verification purposes to determine their eligibility for the prize. 10. Each prize is awarded conditionally upon acceptance and if a winner is uncontactable by 14 April 2019, a supplementary winner may be drawn at the Management of Northpoint City’s discretion. 13. The Management of Northpoint City reserves the right to provide substitute prize(s) of similar value should the specified prize becomes unavailable. The prize must be accepted as awarded and is not transferable, exchangeable for cash or in kind. 15. Data of each participant will be collected, stored and processed for the purposes of administering and assessing this Contest. By joining this contest, participants consent to and grant Northpoint City and the malls of Frasers Retail Property the right to use the contest submission (images/videos) for marketing, promotion and/or advertisement purposes, including print, audio-visual and social media, without restriction or limitation and for unlimited number of times.